For other uses, see Open-field (disambiguation). Open fields near Lisbon, OH. The open-fields doctrine (also open-field doctrine or open-fields rule), in the U.S. law of criminal procedure, is the legal doctrine that a "warrantless search of the area outside a property owner's curtilage" does not violate the Fourth Amendment to the United States Constitution. However, "unless there is some other legal basis for the search," such a search "must exclude the home and any adjoining land (such as a yard) that is within an enclosure or otherwise protected from public scrutiny." The open fields doctrine was first articulated by the U.S. Supreme Court in Hester v. United States, which stated that "the special protection accorded by the Fourth Amendment to the people in their 'persons, houses, papers, and effects,' is not extended to the open fields." This opinion appears to be decided on the basis that "open fields are not a "constitutionally protected area" because they cannot be construed as "persons, houses, papers, [or] effects." This method of reasoning gave way with the arrival of the landmark case Katz v. U.S., which established a two-part test for what constitutes a search within the meaning of the Fourth Amendment. The relevant criteria are "first that a person have exhibited an actual (subjective) expectation of privacy and, second, that the expectation be one that society is prepared to recognize as reasonable'." Under this new analysis of the Fourth Amendment, a search of an object or area where a person has no reasonable expectation of privacy is, in a legal sense, not a search at all. That search, therefore, does not trigger the protections of the Fourth Amendment. … open fields do not provide the setting for those intimate activities that the Amendment is intended to shelter from government interference or surveillance. There is no societal interest in protecting the privacy of those activities, such as the cultivation of crops, that occur in open fields. Courts have continuously held that entry into an open field—whether trespass or not—is not a search within the meaning of the Fourth Amendment. No matter what steps a person takes, he or she cannot create a reasonable privacy expectation in an open field, because it is an area incapable of supporting an expectation of privacy as a matter of constitutional law. 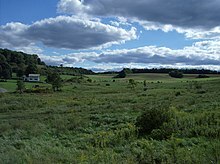 In situations where the police allege that what was searched was an open field, this has the practical effect of shifting the argument from whether any given expectation of privacy is reasonable, to whether the given place is actually an open field or some other type of area like curtilage. This is because a person can have a reasonable expectation of privacy in areas classed as such. While open fields are not protected by the Fourth Amendment, the curtilage, or outdoor area immediately surrounding the home, may be protected. Courts have treated this area as an extension of the house and as such subject to all the privacy protections afforded a person's home (unlike a person's open fields) under the Fourth Amendment. An area is curtilage if it "harbors the intimate activity associated with the sanctity of a man's home and the privacies of life." Courts make this determination by examining "the proximity of the area claimed to be curtilage to the home, whether the area is included within an enclosure surrounding the home, the nature of the uses to which the area is put, and the steps taken by the resident to protect the area from observation by people passing by." Theoretically, many structures might extend the curtilage protection to the areas immediately surrounding them. The courts have gone so far as to treat a tent as a home for Fourth Amendment purposes in the past. (Note: these are 9th Circuit Court of Appeals cases and would not be binding authority in many, if not most, cases.) It is possible that the area immediately surrounding a tent (or any structure used as a home) might be considered curtilage. Despite this rather broad interpretation of curtilage, the courts seem willing to find areas to be outside of the curtilage if they are in any way separate from the home (by a fence, great distance, other structures, even certain plants).